Earlier today, I reported that Ashley Madison’s source code reveals a concerted effort to create an army of thousands of female bots called “engagers” to coax men into paying more for the site’s services. Now we have a chart from the company’s leaked emails that shows how much money they made from the bots. This email, which was found by intrepid pseudonymous analyst @amlolzz, is taken from an April 26, 2012 thread between Avid Life Media COO Rizwan Jiwan and the former CEO Noel Biderman. (Avid Life is the parent company of Ashley Madison.) Here’s another chart from the same thread, which shows conversion rate — that is, how many guests became paying customers. 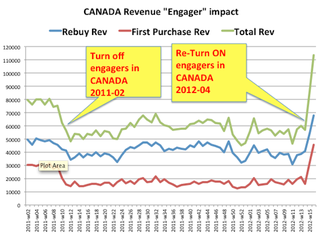 What we see here are two simple graphs showing how engagers affected revenue in Canada. When the engagers were turned off in early 2011, the company’s income took a nosedive. So did their conversion rate. When they were turned on again 14 months later, revenues and conversions skyrocketed. It appears that revenues went from roughly $60,000 per month, to $110, 500. This suggests that the bots were part of Ashley Madison’s strategy to get men to spend money on the site. And apparently they worked marvelously — at least in 2012. Now it’s becoming even more obvious why so much of the company’s source code is devoted to perfecting those engagers in the first place.